Both portable speakers are excellent. In our opinion they’re the top-choice speakers out of the Ultimate Ears lineup and for most people’s uses they’re the top rough-and-tumble, take-anywhere speakers, period. The Boom 3 is currently our pick for top travel speaker, and in terms of best larger Bluetooth speakers we also recommend the Megaboom 3. If you’re in a toss-up between the two, note that most will be quite happy with either. As usual, bigger speakers sound just a bit better, though, particularly on the bass end. Let’s take a look at the differences in detail. Wrap-Up: Which Is Right for You, and What Are the Best Prices? This article was originally published on October 23, 2018. Added better pictures on April 14, 2019. Let’s dig deeper into what these speakers can do and whether it’s really worth going Mega. First it’s worth noting that both the Boom 3 and the Megaboom 3 are recently released updates of the Boom 2 and (yes, they skipped a number) the Megaboom. These previous versions were already at or near the top of the lists in a crowded Bluetooth speaker market, whether from consumer testing organizations or tech reviewers. And as we’ve noted, the Boom 3 is a solid improvement from the Boom 2 and the Megaboom 3 takes a nice step up from the original. Those updates took two of the most durable, great-sounding portable speakers and made them just a bit better. The Boom 3’s and Megaboom 3’s fabric coverings are now tightly woven and slightly shimmery, and a dustproof rating has been added to the already top-notch waterproof rating. The speakers are designed to not allow in any dirt, and can submerged for up to 30 minutes with no ill effects. They also now float, which we suppose is cool enough, but they don’t sound as good that way. Just keep them next to the pool, not in it. Another design addition is the addition of the “magic button” to both the Boom 3 and Megaboom 3, which allows you to play and pause tracks, as well as skip them. (You can skip playlists too but this only works for now with Deezer and Apple Music.) The oversize volume buttons are also still there on both units. Yes we dunked the Ultimate Ears Boom 3 underwater and it didn’t skip a beat. Both speakers have a hang loop at the top that provides a convenient way to carry them with a carabiner for example hooking them to the back of your backpack (our favorite wheeled carry-on backpacks are here). They also both work with the same charging dock, which is totally unnecessary and overpriced … but still kinda nice for displaying them in your living room and providing an easy way to use them and keep them charged when at home. But both the Boom 3 and Megaboom 3 come with their own standard USB-B charging cables and plugs included and that solution works just fine. In fact, the only real difference in terms of design is their size and weight. The Megaboom 3 is just a bit wider and taller than the Boom 3, and a pound heavier. This is nothing major, but enough of a difference for those of us who take a speaker on long trips (like I’m doing right now as I’m packing for Brazil) to result in a strong preference for the Boom 3. 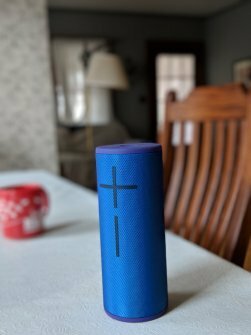 But if you’re just looking for a speaker for the yard or the beach, the Megaboom 3 is still plenty small and compact enough that you’ll carry it with you without hesitation. As is nearly always the case, the bigger speaker sounds better. But that said, for its small size the Boom 3 is about the best you can do in terms of not just bass but overall performance. And it’s not just us saying so, critics overall thus far have praised this small speaker for sounding much more natural than those of the same size, with a neutral, satisfying mix, and great performance at top volumes — and it does go very loud, loud enough to easily fill a large room or be heard on a patio party. One of the most used words in descriptions of the Boom 3’s sound is “punchy” — the speaker delivers a dynamism rather than sounding weak or grainy. In our tests, the Ultimate Ears Boom 3 filled a large living room/dining room with sound and could certainly animate a small party. 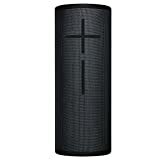 The Megaboom 3 does likewise with an even stronger performance on the bass end. Another great aspect of the Ultimate Ears Boom 3 is that it knocks out 360-degree sound, meaning that it doesn’t make much difference where you are standing around the speaker — it will still sound great. If you’re outdoors, you can put it in the middle of the action and keep a good-sized dance party going. 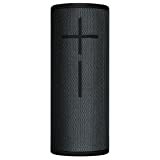 The same is true of the Megaboom 3; it’s 360-degree sound is excellent and it offers the same punchiness. It’s getting top accolades from critics and described in very similar terms. Where the Megaboom 3 does better than the Boom 3 is above all in terms of bass end. Bass-heavy tracks have more depth and apparent complexity. 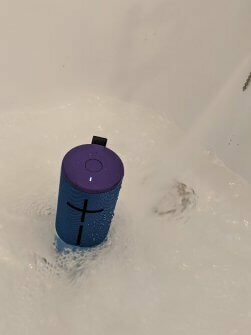 While no portable speaker is going to sound as good as a full quality audio system with a subwoofer, the Megaboom 3 is certainly the best you can do for such an indestructible portable unit, and for most sets of ears is going to be satisfying enough even used as a home speaker. There is a bit more separation of instruments and idea of a soundstage on the Megaboom 3 than the Boom 3. The Boom 3 and Megaboom 3 both can be adjusted via their dedicated apps for iOS and Android. This allows adjustments to EQ and if you have two of either unit you can form a great stereo pair. That’s particularly interesting both for louder volume and for creating a greater sense of stereo and space. If you’re still stuck between the two at this point, consider getting two Boom 3s and pairing them together for stereo — and if that’s two much to carry for a particular outing you can always just take one. The warranty for both speakers is two years, which is a year more than most comparable speakers. Pricing as of this writing has been stable, but it’s always worth clicking over to Amazon and clicking around on the different color options as sometimes we’ve seen this brand’s speakers varying quite a bit by color selected. We always try to link to the cheapest color but things often change, so do check once you’re there. You can buy two of either one and pair them for a great portable stereo system; we think this is particularly interesting to do with two Boom 3s.